In addition to the new IoT Dev + Test conference, a new 2-day training course has been added to help testers learn how to better automate their mobile testing efforts, Effective Mobile Automation using Appium®. 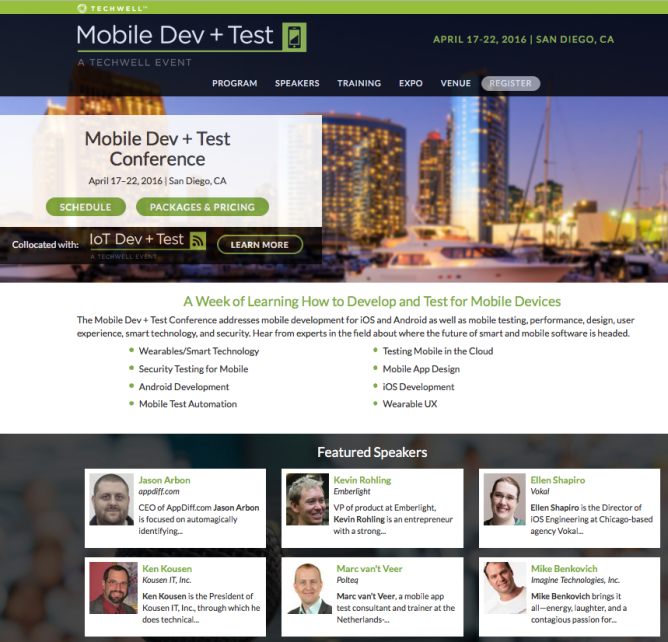 Explore the mobile and IoT software testing tutorials, keynotes, and sessions, view the full Mobile Dev + Test schedule and the full IoT Dev + Test schedule. Join us Friday, April 22 for the bonus, half-day session, Designing Apps for Android Devices with Luke Wallace. It will be an interactive exchange of ideas and experiences with other Android developers and designers. Learn design principles that guide the Android team within Google itself. Explore the unique challenges facing Android development and design, hear what’s working—and not working—and share your experiences in a team setting. You’ll also have hands-on exercises and work on your own app ideas! Don’t forget to visit the Expo and check out solutions to your problems from leading industry service and tool providers such as Perfecto Mobile, MobileLabs, SauceLabs, and more. Register using exclusive Android Police discount code, MDT16AP to save up to an additional $200 off! If you register by Friday, February 19 you can combine this discount code with super early bird savings for up to $600 off (valid on packages over $400, discount is dependent on package selected).